The best neck massager is waiting for your neck to fit perfectly on it, and massage away your stress. There are dozens of different massage cushions on the market, and they all work on your neck, shoulders and back – at a minimum. Many of these pillows will work other areas of the body when needed, and choosing the right one requires you to compare all of the features offered by these wonderful cushions. But which features should you be looking at specifically? Charging: Where do you intend to use your pillow? Some people will only use their pillow in their home, but if you want to use it in your car, you’ll want to make sure the pillow you choose comes with a car charger. Massage Heads: The massage heads are the magic behind these pillows. These are the electronic parts that will be responsible for your deep kneading massage. A good rule of thumb is that the more heads that are offered, the better. Heat vs No Heat: Heat allows the muscles to relax, while the massage melts away tension. I would always choose a heated massage cushion, and you should, too. 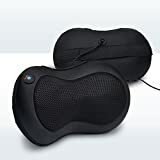 Zyllion ZMA-13-BK Shiatsu Massage Pillow – Zyllion offers the best neck massager as budget option so that it is a luxury you can afford. 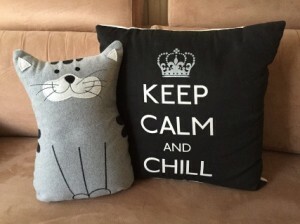 Offering a unique black design, you can take this pillow with you in the car, on the train or let it massage you to sleep at night. A heating function melts away muscle pains and aches, while the ergonomic design is perfect for your neck, back, shoulders and even legs. An adjustable strap allows you to secure this pillow to your vehicle, or any other surface you wish. And there are four, deep kneading Shiatsu massage heads that melt muscle tension and stress away. This pillow has a 20-minute auto-shutoff and is the perfect size (13” x 2.4’ x 9.5”). Shiatsu Neck & Back Massager Pillow – A U-design allows this pillow to fit perfectly on your neck, back, thighs, calves and stomach. Ergonomically designed, this pillow will contour to your body and offers a hot stone massage for a relaxing experience. You can turn this setting on or off if you wish. Portable, this unit even comes with a car charger, so you can charge it on-the-go. One minute timers are present that change the focal point of the massage to work all across the pillow’s length (13-inches) for an exceptional massage. If you want a heated, stone massage (Shiatsu) that is perfect after a stressful day at work, this is the choice for you. Shiatsu Back Massager – I’m not sure what to call this massager (is it a pillow or a strap?). I just don’t know how to classify this one. But I do know that it belongs on my massage cushion reviews because it’s unique and provides a high-quality massage that targets hard-to-reach areas of the body. This unit operates in a bi-directional fashion to mimic a massage given by a massage therapist. There are 4 massage nodes for deep massage availability, and a heated massage loosens tight muscles and eases tension away. What I really like about this model is that you can throw it over your shoulders, kind of like a backpack, and it can target your neck, shoulders, waist and back area effectively. If you’re not really looking for a pillow but want a great massage at home, this is the right choice for you. HoMedics Thera-P Shiatsu Massage Pillow – Deep kneading bliss is the best way to describe this pillow from HoMedics. I love this pillow because it looks just like a decorative pillow you would throw on your couch, but it is so much more. 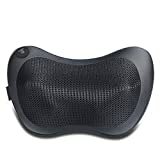 There is a comfort flap that provides added cushion for a soft massage, and integrated controls that perfectly massage your neck and upper back. This unit can perform a Shiatsu massage to relax tense muscles, or it can work as a heated pillow – or both (my favorite). You can even remove the case and wash it (you’ll see the electrical cord and system inside), so cleaning is a breeze. Nekteck Shiatsu Deep Kneading Massage Pillow – Relieving tense muscles is a breeze thanks to Nekteck. This amazing pillow features four Shiatsu massage heads that are meant for deep-kneading. If you have a kink in your neck that simply won’t go away, this is the pillow you want by your side, or under your head. A 6.6” power adapter is available, so you can use the unit even when the battery is dead. The company also includes a car adapter for free. I prefer to use this pillow when I’m stuck in rush-hour traffic because it’s just the right size to fit under my headrest comfortably. A heating function is available, too, and the pillow conforms to the contour of your body. All of these massage pillows are backed by our personal review, but it would be silly to buy them all, right? We’ve been fans of these pillows for years, and we know what you can do to narrow down your choices to find the best pillow possible for your needs. P.S. Keep in mind the tips that we mentioned at the beginning of our article. Massage Type: Shiatsu is most common, and we recommend getting a pillow that offers heated massages. You’ll also find pillows (one on our list) that offers a hot stone massage. Bi-directional massages are the right choice if you want a massage that feels like the one you would get from a massage therapist. Cost: Always go into the buying process with a budget in mind. You’ll want to choose the best massage cushion in your price range, but don’t overspend. Portability: A must-have for a commuter. If you’re on the train going home after working 12 hours or in the car stuck in bumper-to-bumper traffic, you’ll wish that you had your neck massager with you. Portability is key in these situations, and you’ll also want to ensure that the pillow can strap onto your headrest. Targeted Areas: Neck, shoulders and backs are almost always included in the massage pattern of these pillows. But many can also be used to massage your calves, thighs and other areas of the body. Go into the buying process knowing which areas are a must-have for your massage pillow. With the tips above, you’ll be able to choose a massage pillow that is perfect for your needs.